Of my cooking, it has been said, "When [I'm] on, [I'm] on." And it happens to be true. When I'm on, I can turn out some pretty good stuff. Of course, the rest of this evaluation (implied but unspoken) turns out to be equally true. When I'm off, I'm off. This is one of the reasons we don't entertain more than we do. A big one. The other big one, I would say is Brian's lack-of-desire-to-entertain. I don't think he thinks about it much, so almost always, if we do have people over, it's pretty much all on me. That doesn't mean he won't help out, but it is obvious that when it is my idea, it is me who does most of the work--with the exception of clean-up. My sweet husband rolls up his sleeves and cleans up after dinner, wheter it's Thanksgiving or just a random Thursday. Such a good man! Yep. When I'm on, I'm on, but when I'm off, it's time to call for pizza. This means that if I consider having people over to dinner, I am potentially subjecting them to a night of bad food. Hard to do. This is why, I guess, mostly I invite people over who I am confident possess a degree of unconditional love for our family. I once made a casserole with spam, eggs, noodles, condensed mushroom soup, bread, brussel sprouts, copious amounts of Velveeta, and an abundance of ketchup. It was served cold. I served it inverted on a platter, garnished with fresh brussel sprout leaves and a big squirt of ketchup. There are pictures. The ketchup was the kicker, because our friend and dinner guest for the evening, Jami, has an unnatural fear of condiments. She literally has never tasted most condiments and does not like to touch them. To be fair and honest, no one ever actually tasted that 'Fiesta Bake.' I cracked up (hysterically) before Jami got it to her mouth. I think, to her, it ended up being something like a near-death experience. That Fiesta Bake was the center of an elaborate plan to freak out those new friends of ours and test their mettle. (Now that I think about it, it was a clever way to induct them into dinner at our house. As bad as dinner could get, it would never hold a candle to that Fiesta Bake!) I clearly have issues--let's just take a moment to respect that. Know what? In retrospect, the funniest part of that night is that the "real" dinner, which was in the oven, was salmon. Our friend JT hates fish, unless it's sushi. We didn't learn that until later. He and Jami were true troopers that night and have been ever since. They even enlisted the help of her parents to get us back with a terrible, terrible breakfast involving uncooked beans (or something). A moment of silence in respect for the terrible breakfast (which had a name which I have forgotten), and the fiesta bake, please. There was another time it got bad with Jami and JT. Until I have time to fully flesh out this story, let's just say that it involved me trying to pass venison off as beef in a bean soup, and that it did not pass. We ordered pizza. That was my first time trying to use venison (and probably my last). Maybe you're wondering what prompted this post about culinary disaster. Are you? 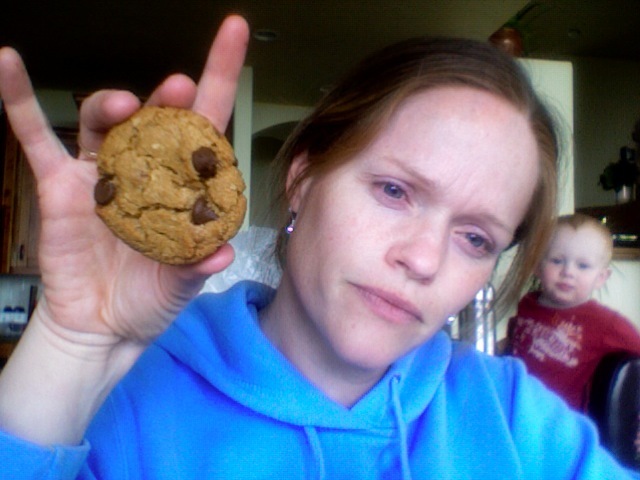 This afternoon, I made (deep breath) peanut butter oatmeal ginger chocolate chip cookies. Interesting. No, you may not have the recipe, because there isn't one. And is it another disaster? The kids like them, maybe not a disaster, but an adventure. We owe a lot to Star Trek. But seriously, folks. After explaining to Lucy the other day that when I was a kid, phones were attached to the wall and didn't play music and no one texted, televisions were gigantically fat etc... I remember something somebody wrote (which I read) that pointed out the role that science fiction plays in directing inventive minds. Dream it, do it. On Star Trek, they were using communicators (Blue Tooth headsets) and touch screens to get things done a long time ago. Thanks, Gene Roddenberry! On a final note, unless I was too sleepy to notice, I think Charlie slept through the night last night! (10 - 6) I'm not holding my breath until this happens again. And give it back to me more beautiful. The heart belongs to him who knew it best. The downside to baby wearing is this: Although it is convenient to have a baby strapped to your chest, and facilitates housekeeping and caretaking of older children, every once in a while, you may find yourself looking down at the baby and making eye-contact. At this point, said baby may decide to smile at you and goo adorably. Most babies at this point in their development will not be very articulate. 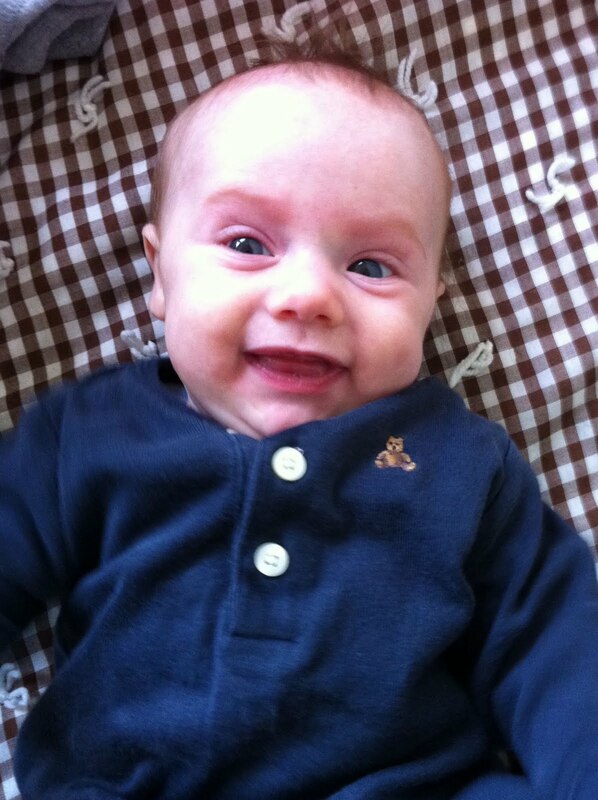 If one were to translate the look and expression from the worn baby, it may be something like this: "Hi there! I like to be with you! I am very cozy and enjoy what we're doing here. Want to smile at each other for a while?" "My goodness!" you will say to yourself, "Here I am going about my business, having forgotten what a charming person is attached to my chest!" You then will certainly doubt, at least momentarily, that the housekeeping and sandwich making and laundry folding you have done were more important or better than having a staring/smiling contest with the small charming person you haven't thought of in an hour. Thought you all ought to know.